Create long-term partnerships in local communities. Build bridges with diverse populations. 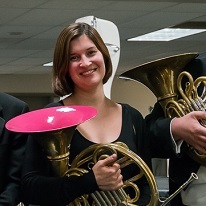 Involve people in music-making with Seattle Symphony musicians. Continue to develop our own learning about how to connect with communities and with audiences. In the fall of 2012 we began this project as an experimental model for artistic collaboration between the Seattle Symphony and indigenous communities in and around the metropolitan region. In 2015 NLCCP will reach the final stage of a three-year initiative. A series of cultural exchange events were held over parts of two years to facilitate sharing of traditions and ideas between six Pacific Northwest tribal groups and Symphony musicians and educators. The Potlatch Symphony was created, consisting of members of the six Pacific Northwest tribal groups and musicians of the Seattle Symphony, performing together. 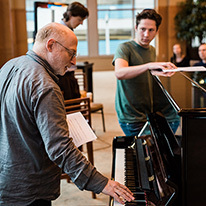 The world premiere performance of the Potlatch Symphony was presented as part of Seattle Symphony’s free Day of Music celebration at Benaroya Hall in Seattle. Audience attendance was estimated at several hundred. It was led by Composer in Residence Janice Giteck. The Lullaby Project was designed by Carnegie Hall to offer mothers in distressed situations a unique opportunity to write a personal lullaby for their babies. Its broader purpose is to empower these mothers both as artists and as individuals. The creative workshop — gives mothers an opportunity to write letters to their children expressing their hopes, wishes and dreams for them. From these letters the teaching artists help pull out phrases and words that will become verses and melodies. They ask the women what kind of mood or style they want and the lullabies start to take shape. The creative workshop lasts approximately 6 hours. This season the Symphony is adding a live performance of the lullabies. This will take place the Saturday of Mother’s Day weekend on May 9, 2015. The Seattle Symphony is committed to expanding relationships with all members of our community, including those who are incarcerated. In October 2011, the Symphony presented an inaugural chamber recital at the Monroe Correctional Complex. The event also included instrument exploration where inmates had the opportunity to play violin and viola. Over 80 people were in the audience including 65 inmates, guards and volunteers. The Symphony has continued to present regular recitals at the Monroe Correctional Complex and has collaborated with local artists such as Amy Rubin and Eduardo Mendonça to help bring music and healing to the inmates. This season, the Symphony is expanding its prison program to the Washington Corrections Center for Women in Gig Harbor. Experience the transformational and inspiring impact of great music free of charge! 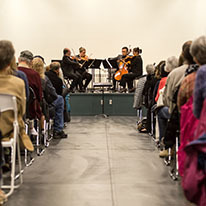 Community and Side-by-Side Concerts are made possible with support from 4Culture, the Seattle Office of Arts & Culture and Kjristine Lund. The Seattle Symphony performs side-by-side with members of the Seattle Youth Symphony Orchestra in a free concert at Benaroya Hall. The Seattle Symphony performs side-by-side with the University of Washington Symphony Orchestra at Meany Hall.